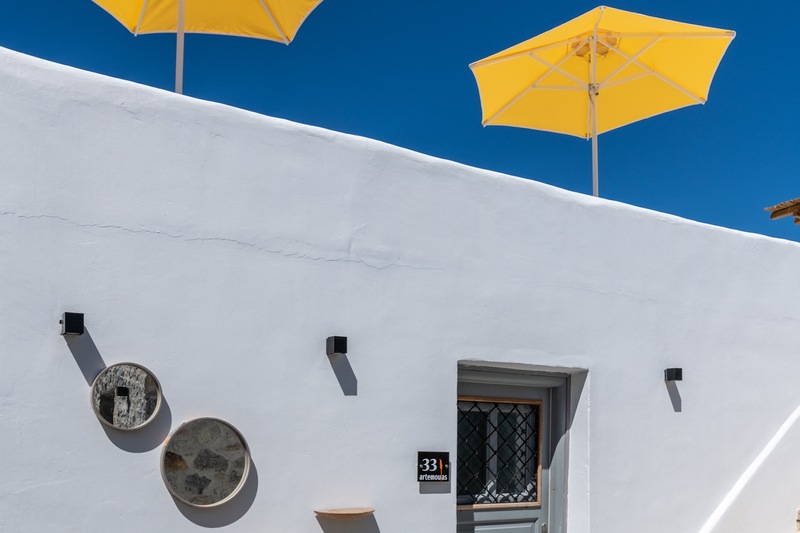 Artemoula’s Studios are set in an inviting setting on Mykonos island, only 300m away from Platis Yialos beach. 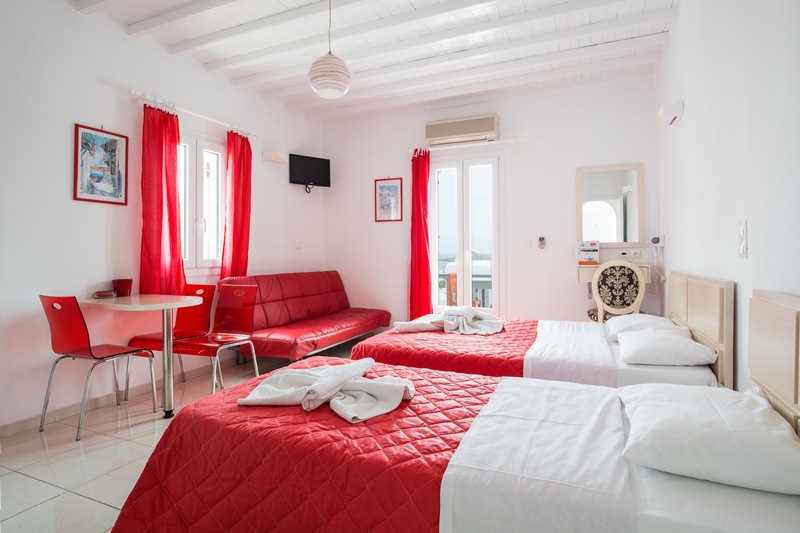 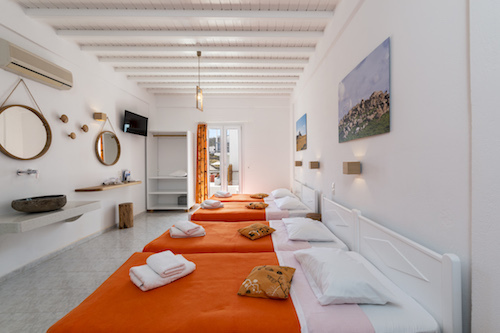 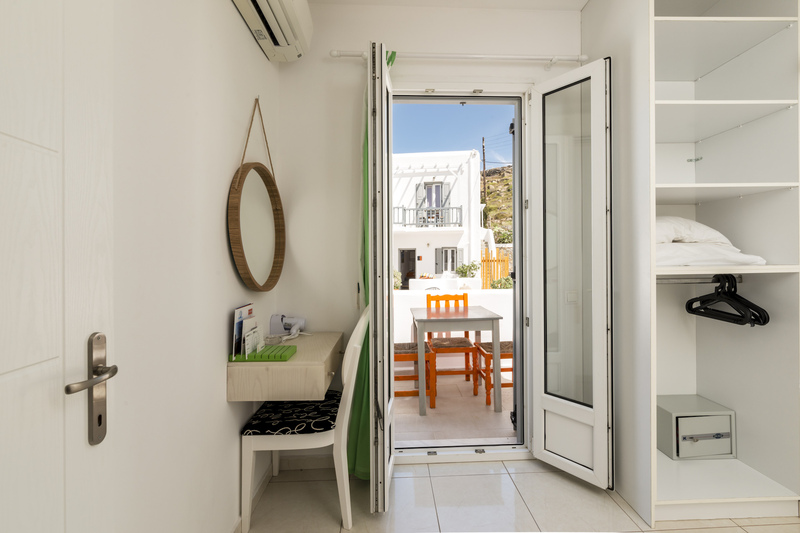 Our stylish studios on Mykonos have been recently renovated, featuring an elegant pop decor combined with design furniture and offer beautiful views of the sea and the surrounding area. 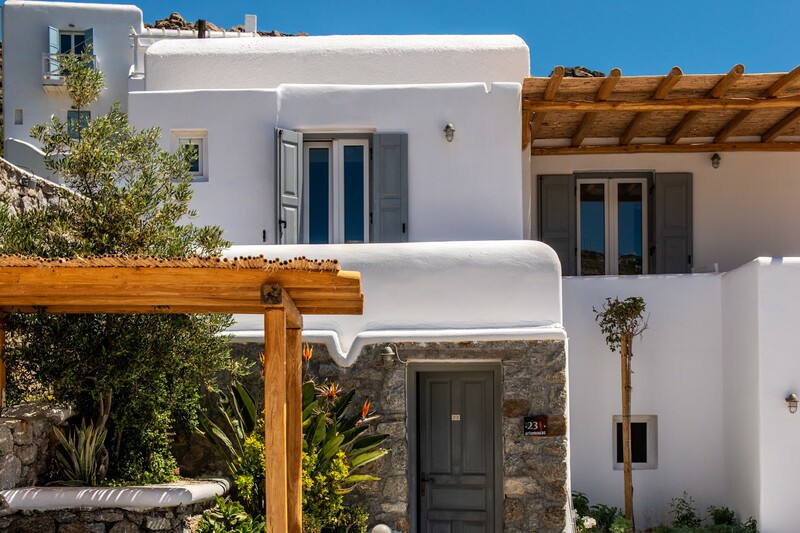 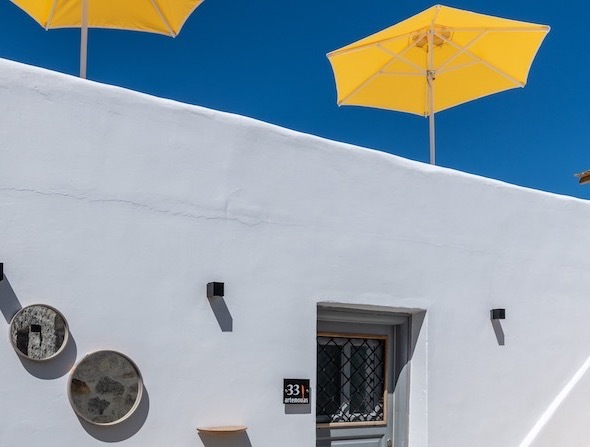 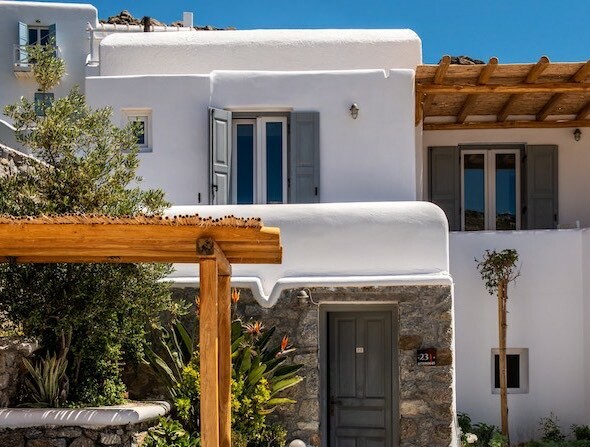 Located just 4 kilometers from the lively town of Mykonos, our stylish studios in Platys Gialos, embrace the enchanting Cycladic architectural style. 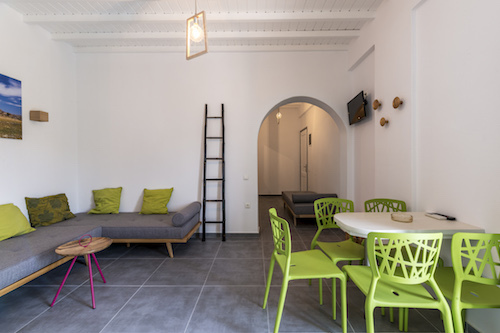 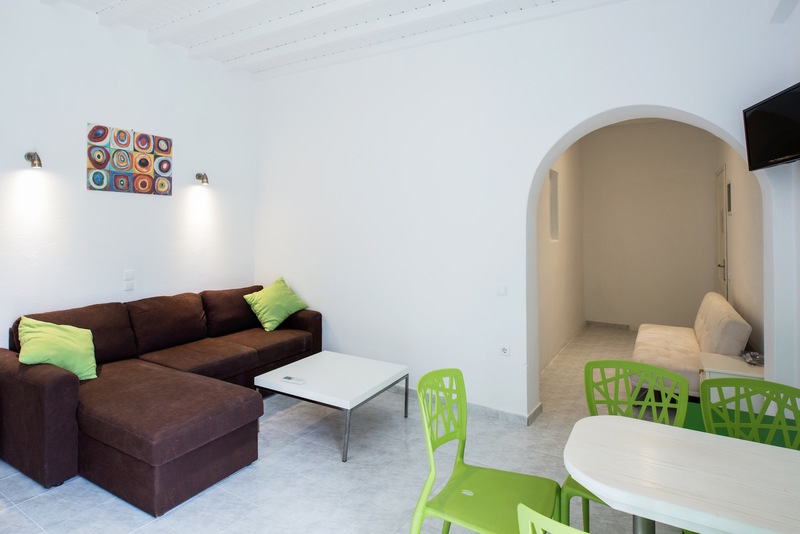 Artemoulas Studios feature recently renovated stylish rooms in Platys Gialos with an elegant pop decor combined with design furniture. 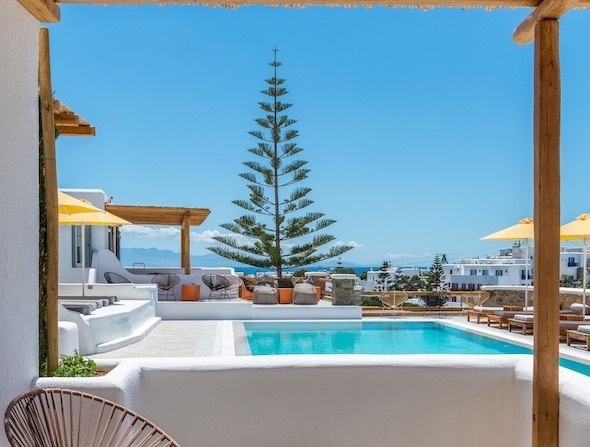 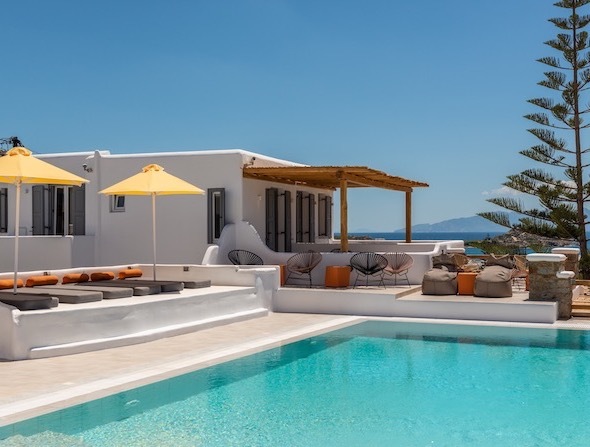 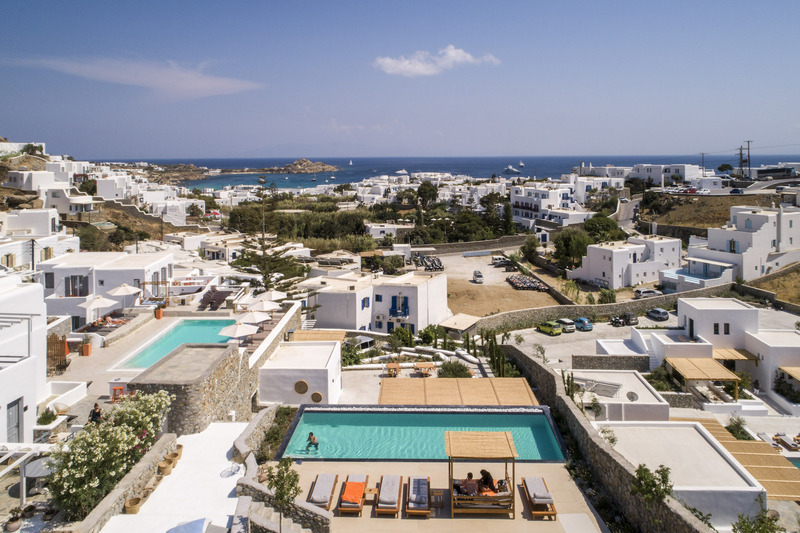 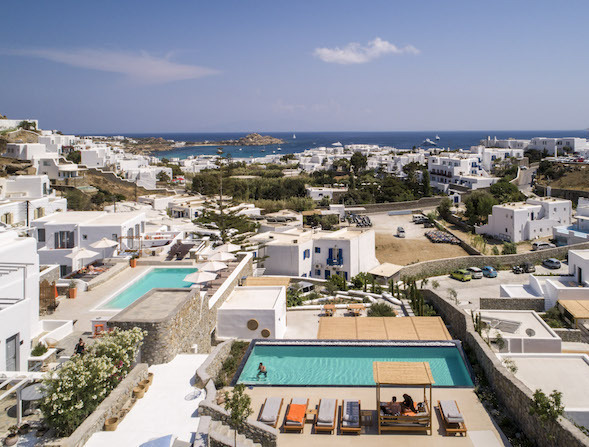 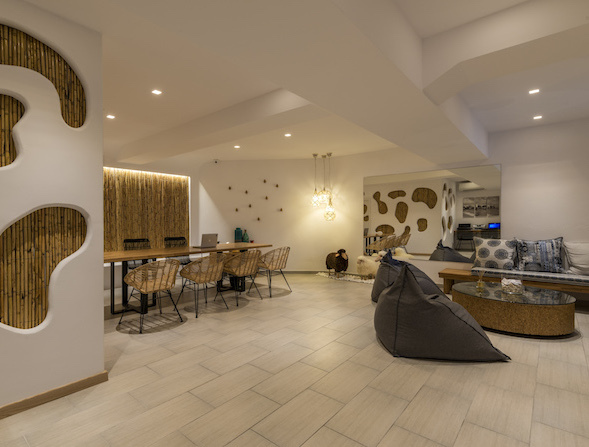 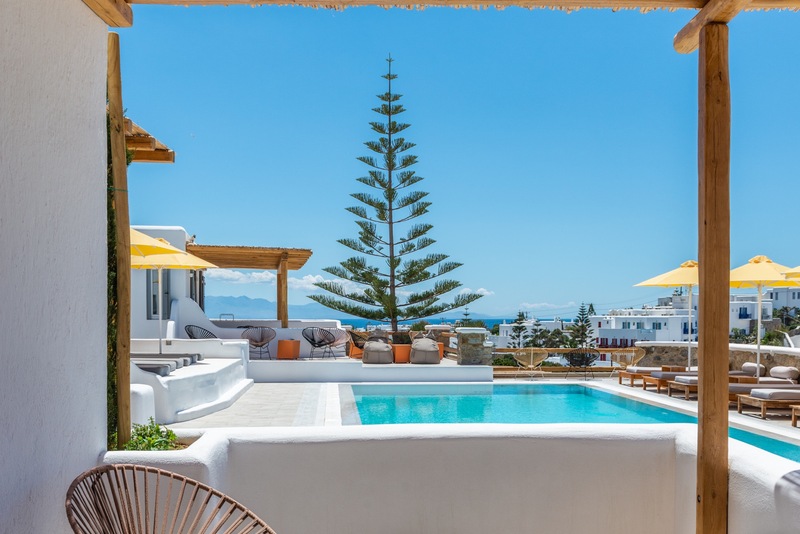 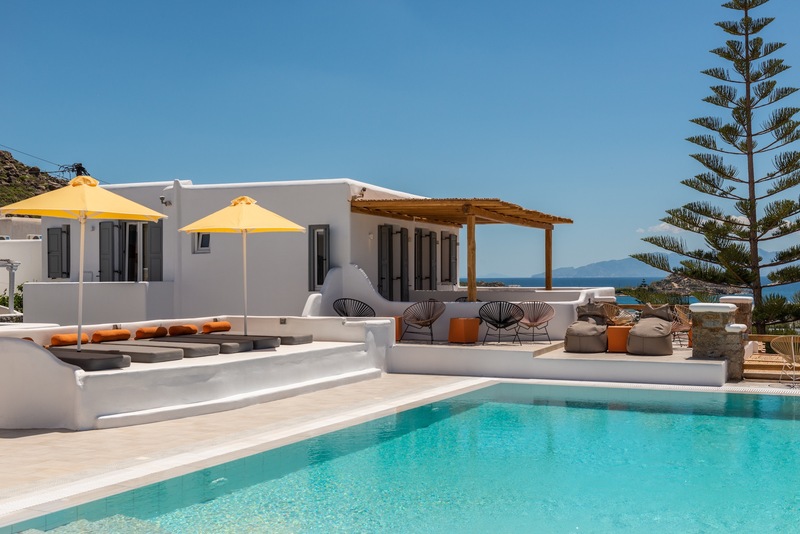 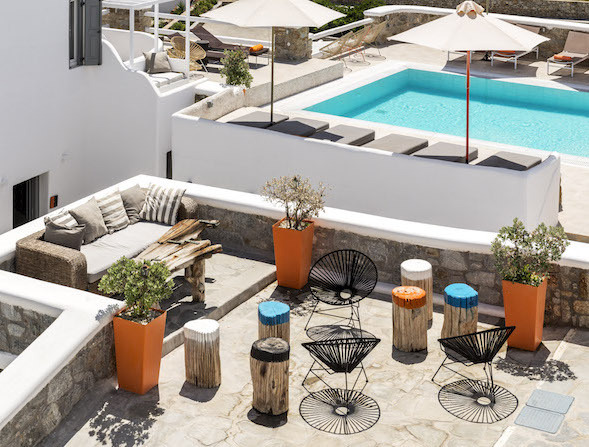 The rooms' vivid pop-art ambiance, its fun-loving atmosphere, commodious rooms, and value for money rates, plus its residential locale make Artemoulas Rooms in Mykonos a solid choice for most travelers. 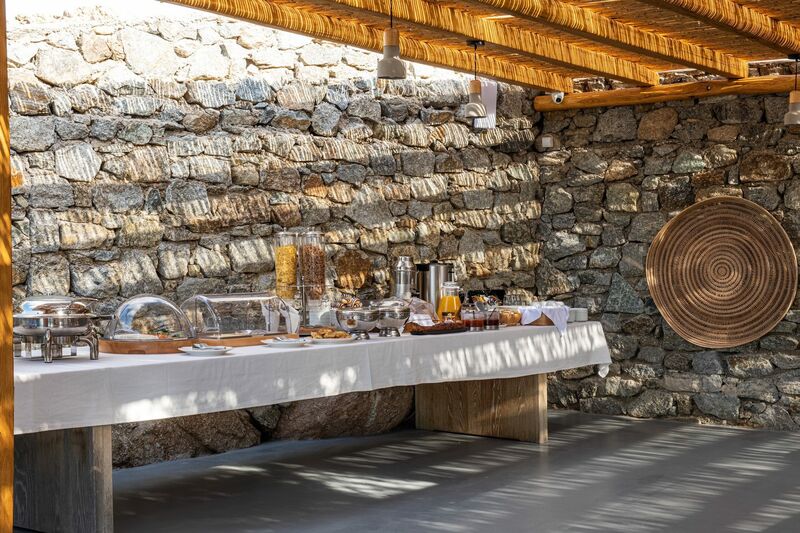 Situated at the pool area and offering panoramic sea views, the Pool/Snack Bar is a cool oasis and the ideal place to unwind and enjoy a refreshment or a quick snack. 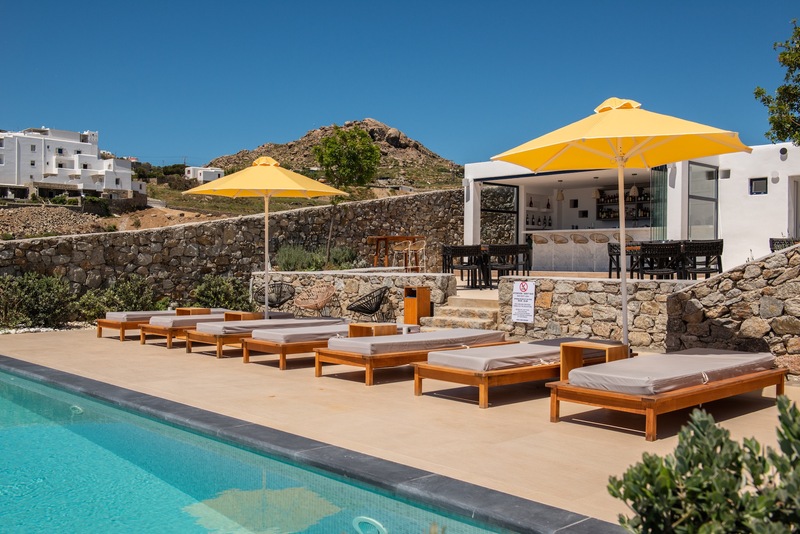 Our Pool Bar features a comfortable setting, where our guests can lounge, bask in the sun, relax and enjoy cocktails by the swimming pool. 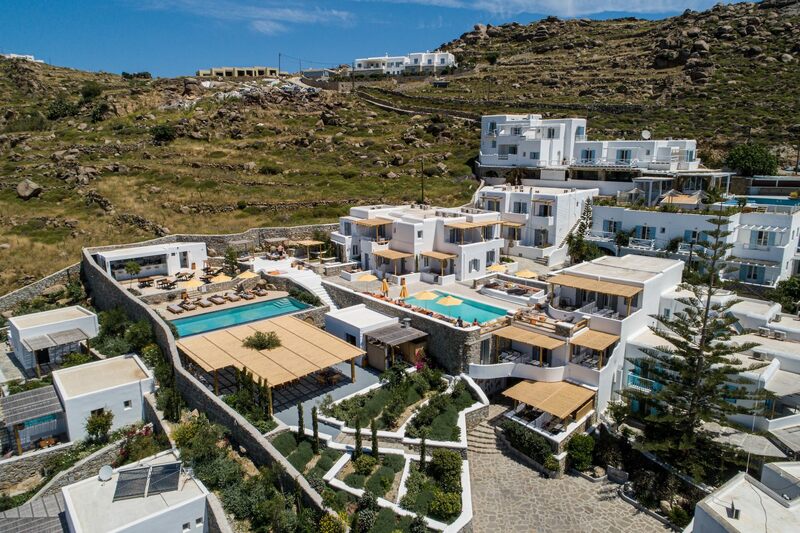 A true oasis for your senses. 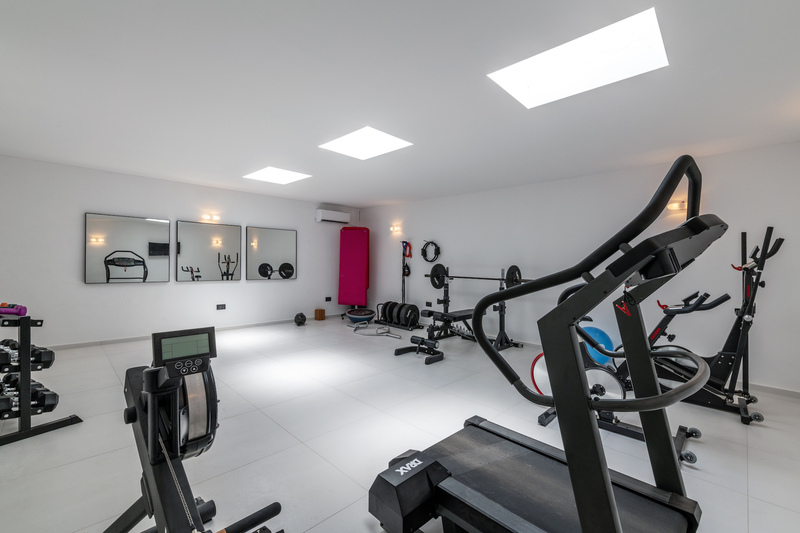 Energise your stay and maintain your daily exercise routine, even while you're away from home. 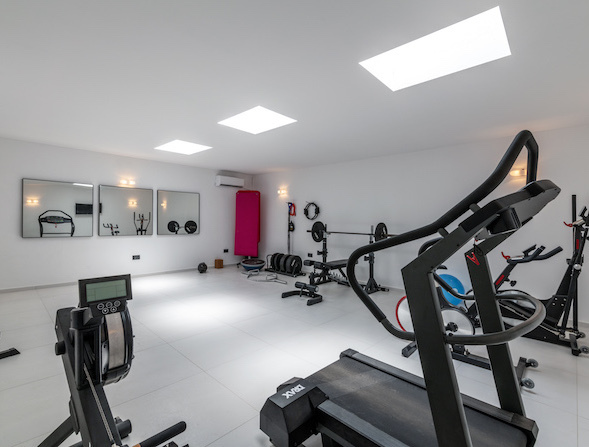 Artemoulas Studios offer complimentary use of its fully equipped fitness centre, to help you keep an active lifestyle, during your holidays. 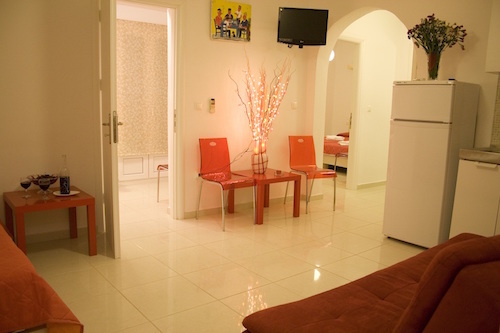 Comfortable studio with fully equipped kitchen and fridge for two persons. 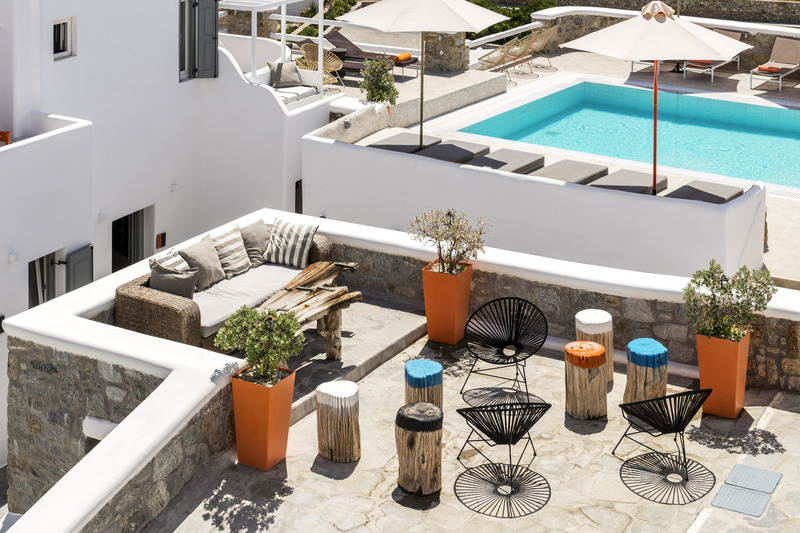 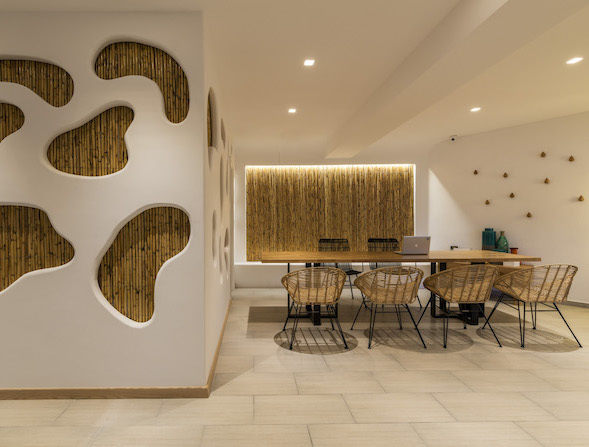 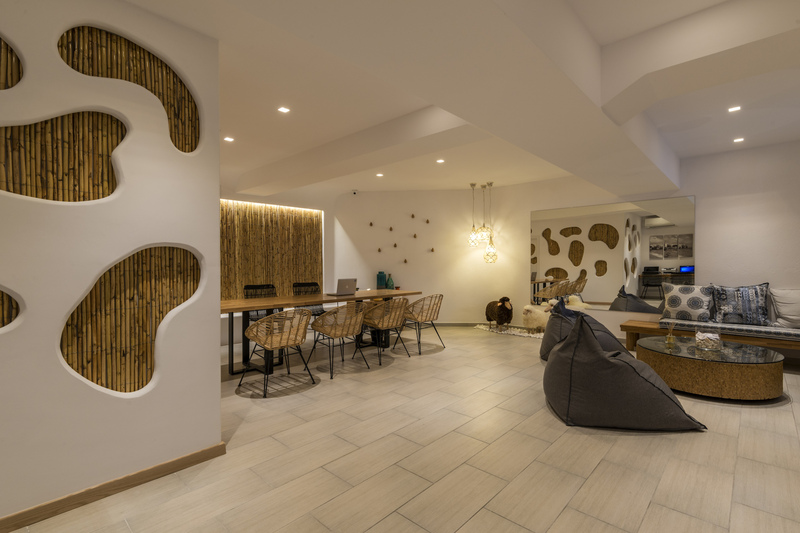 Our stylish studios in Mykonos have been recently renovated, displaying an elegant pop decor combined with design furniture and offer beautiful views of the sea and the surrounding area. 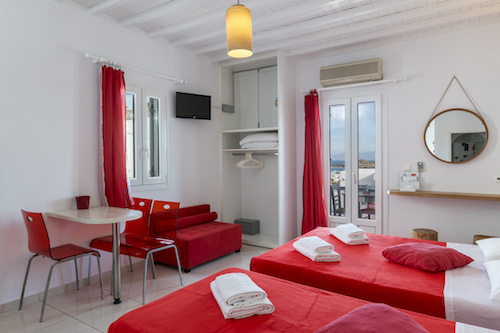 Featuring a private bath tub or a shower, this double studio, also comes with satellite Tv, a hairdryer and free toiletries. 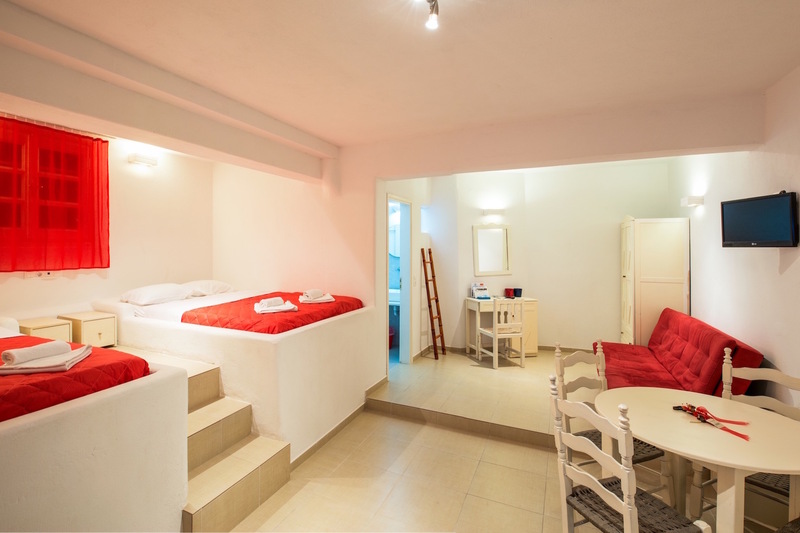 Comfortable studio with fully equipped kitchen and fridge for three persons. Our stylish studios in Mykonos have been recently renovated, displaying an elegant pop decor combined with design furniture and offer beautiful views of the sea and the surrounding area. 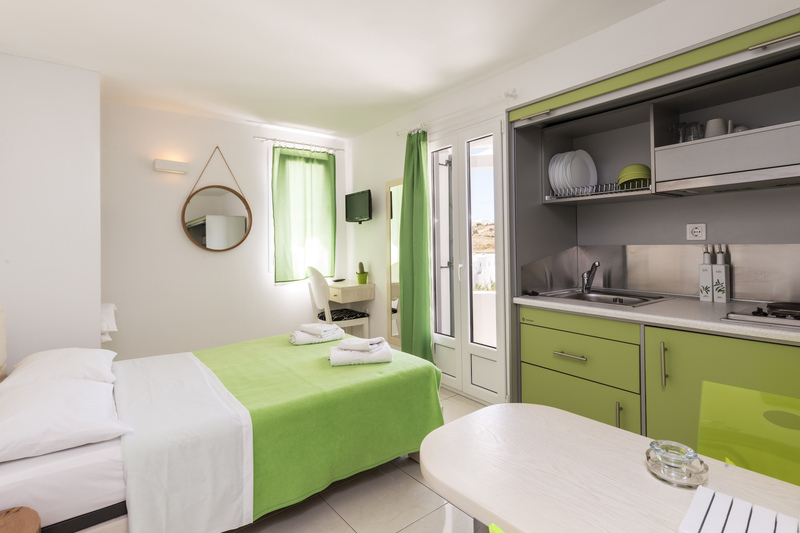 Featuring a private bath tub or a shower, this triple studio, also comes with satellite Tv, a hairdryer and free toiletries. 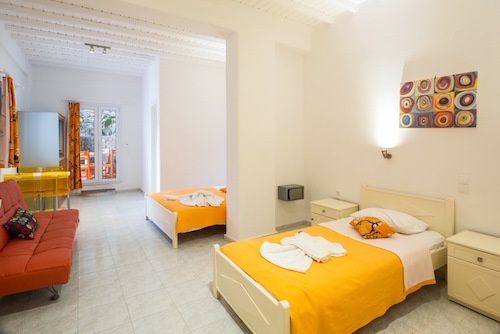 Large comfortable room with kitchen and bathrom for four persons. Our stylish studios in Mykonos have been recently renovated, displaying an elegant pop decor combined with design furniture and offer beautiful views of the sea and the surrounding area. 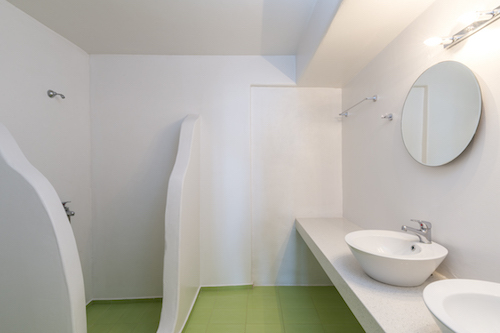 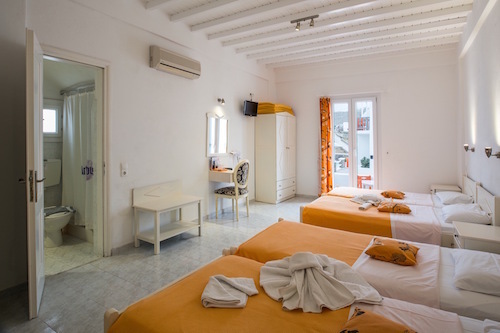 Featuring a private bath tub or a shower, this quadruple studio, also comes with satellite Tv, a hairdryer and free toiletries. 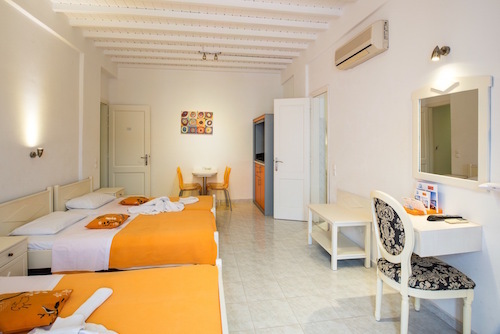 Large room with satellite TV, fully equipped kitchen and bathrom for family. 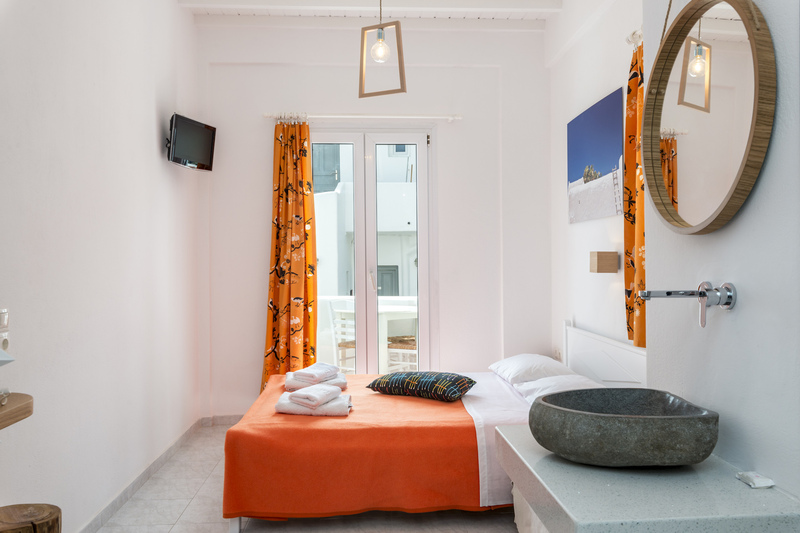 Our stylish studios in Mykonos have been recently renovated, displaying an elegant pop decor combined with design furniture and offer beautiful views of the sea and the surrounding area. 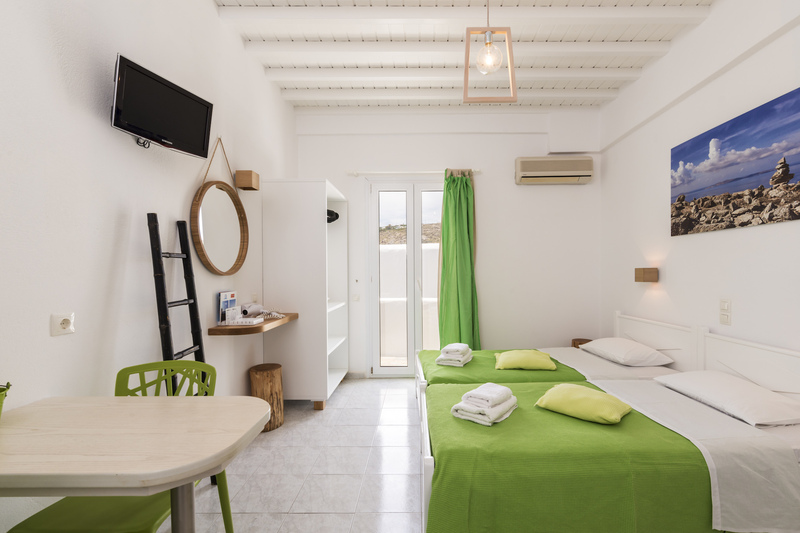 Featuring a private bath tub or a shower, this two-bedroom studio, also comes with satellite Tv, a hairdryer and free toiletries. 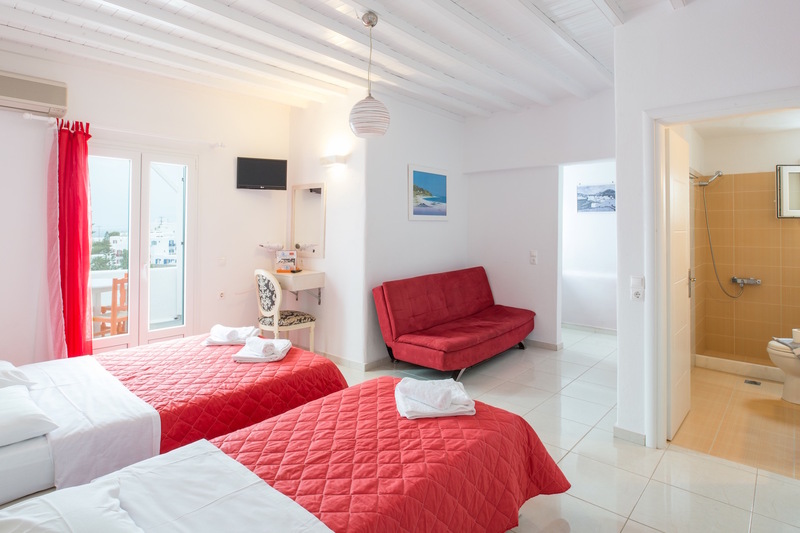 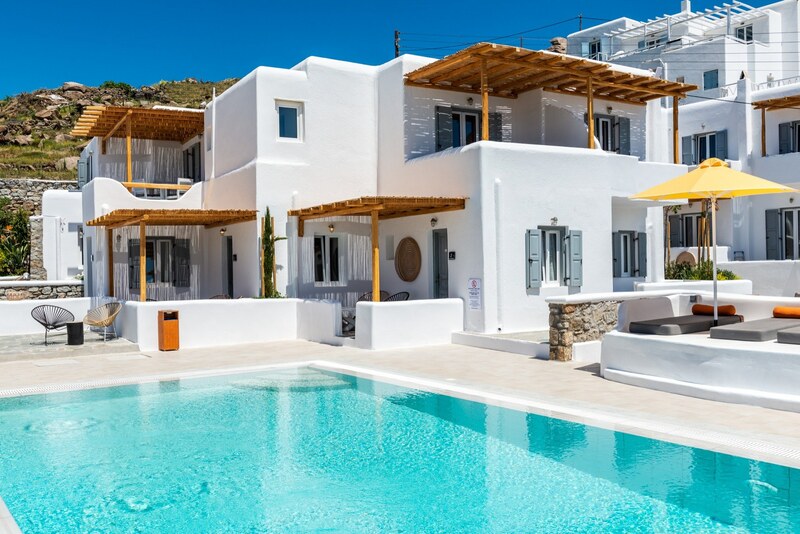 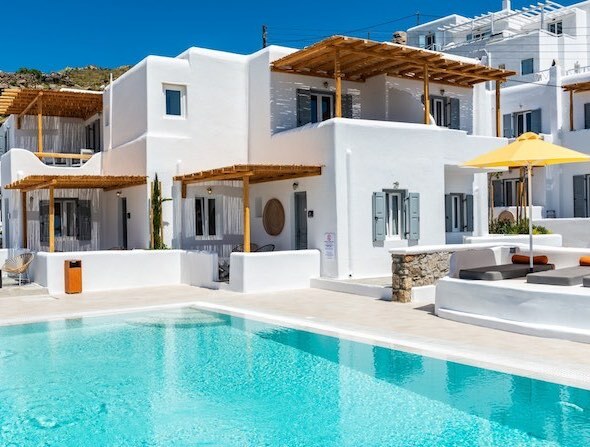 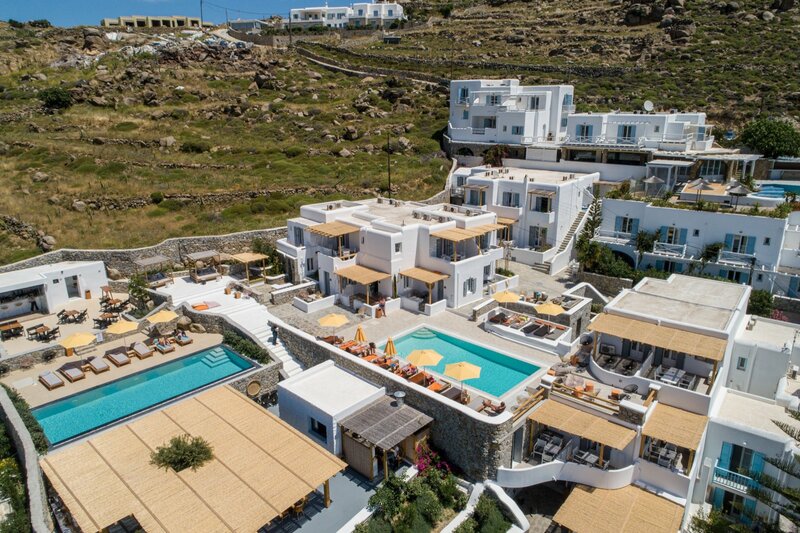 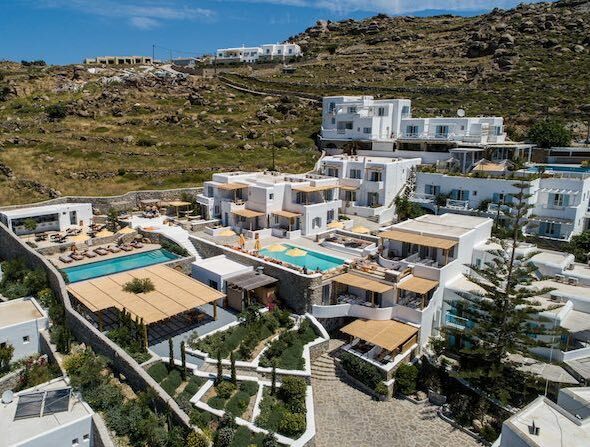 Artemoulas Studios is approximately 15 min driving distance from Mykonos Port while only 10 min min driving distance from Mykonos Town and Mykonos Airport. 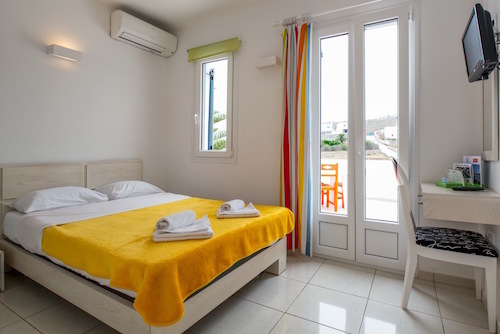 Platys Gialos Beach is within walking distance and also the popular beach of Psarou is only 3-5 min driving distance. 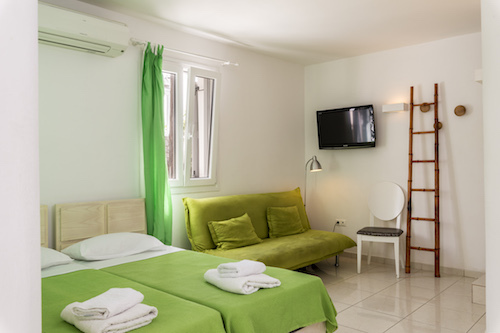 Artemoulas studios is deployed in a serene setting, overlooking Platys Gialos Beach. 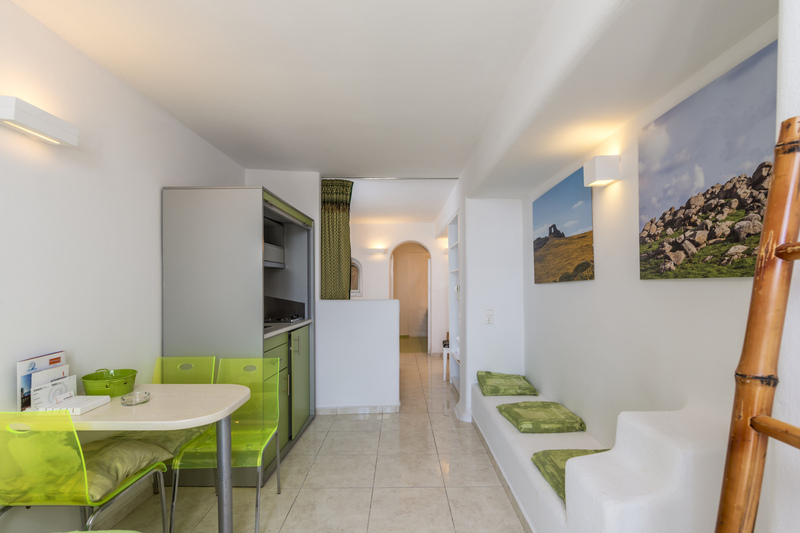 All the rooms and halls are in range of high-speed Wi-Fi Internet. 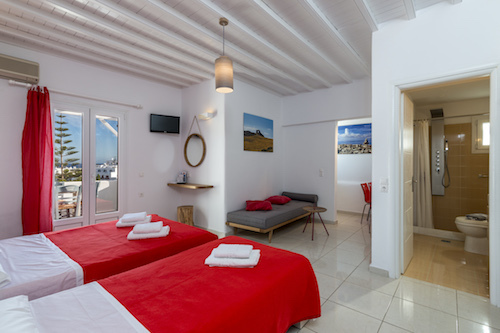 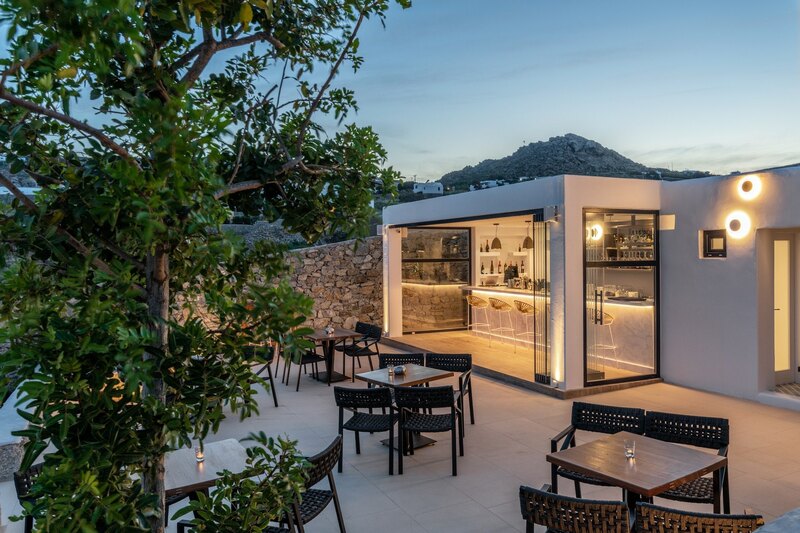 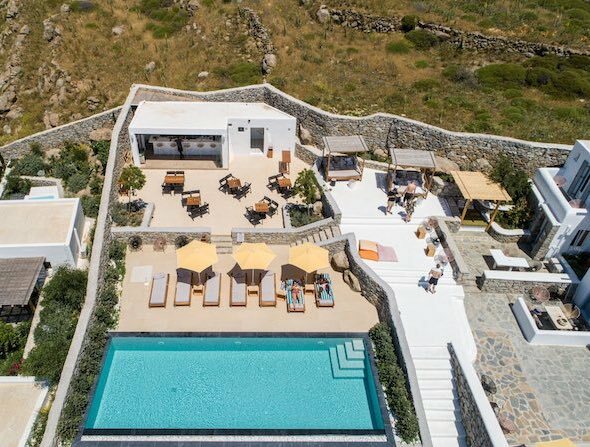 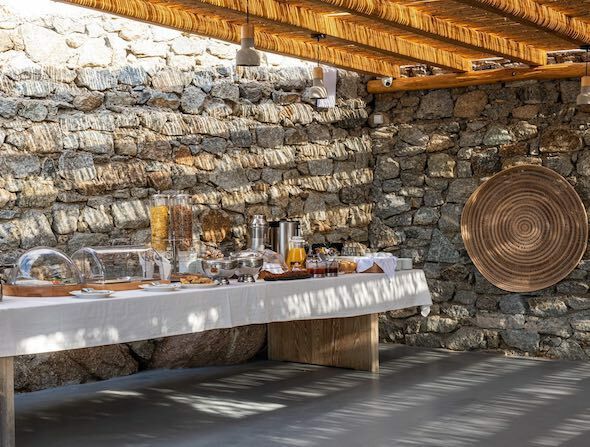 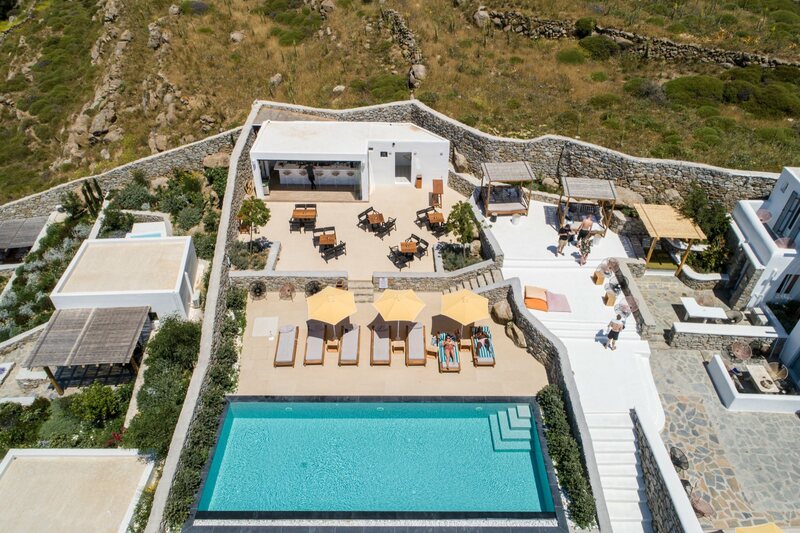 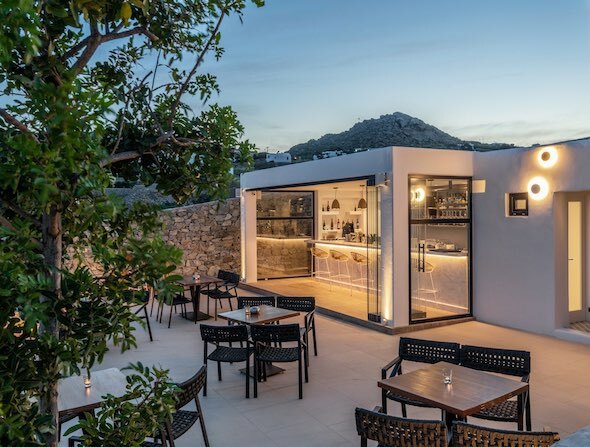 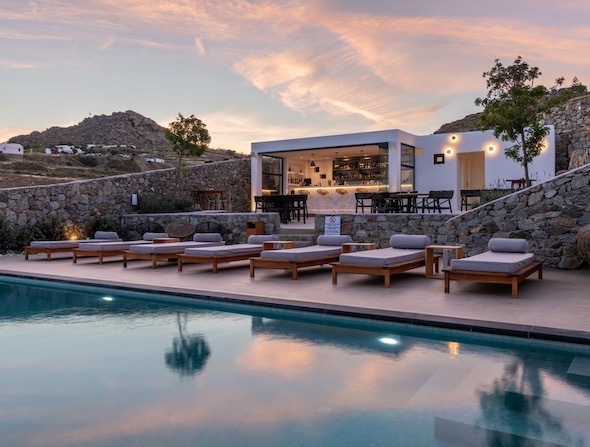 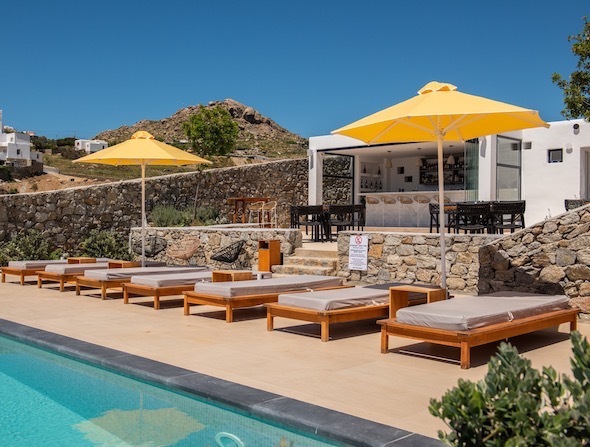 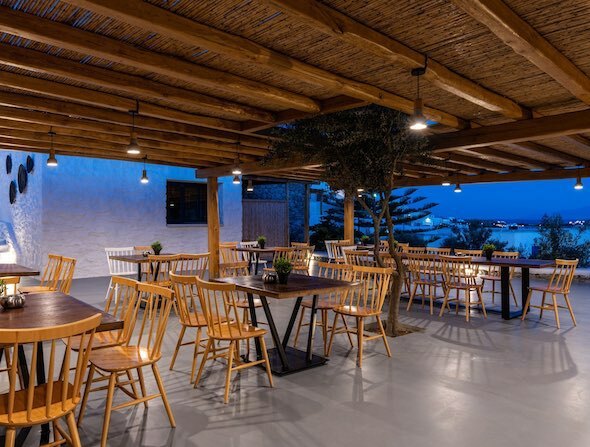 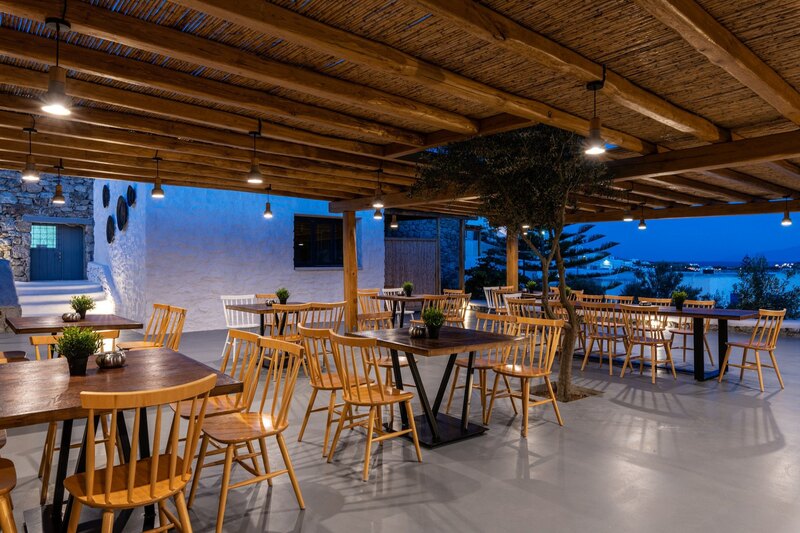 The friendly owners of Artemoulas Studios in Mykonos offer their hospitality and organized services, in order to help you enjoy a relaxed and memorable holiday experience.